Sure-gal Cold Glavanising Spray forms a flexible, tough coating of 95% pure zinc which electrochemically bonds with base metals. It protects base metals from rust and corrosion through galvanic action. 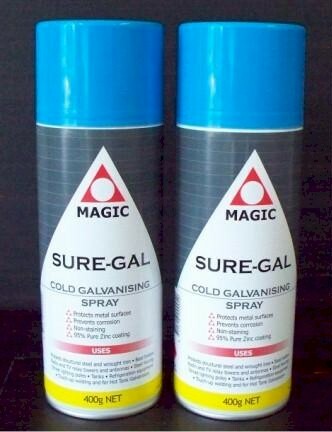 Sure-gal Cold Galvanising Spray is ideal for use on: Structural Steel and Wrought Iron, Boat Trailers, Radio and TV Relay Towers and Antennas, Steel Fencing, Street Lighting Poles, Tanks, Refrigeration Equipment, Touch-up in Welding and for Hot Tank Galvanisers.